Oxford Educational exam packs offer a hassle-free and superb value solution for exam season. The FX83GTX Exam Pack contains a full geometry set in a tin, a Casio FX83GTX scientific calculator and a fully transparent plastic pencil case, packed in a transparent A4 Project Case! Order any quantity for immediate despatch. Choose your colours from the drop-down box below! Order 30 or more FX83GTX Exam Packs and recieve an automatic 46p discount off of each pack - only £9.74 each! Oxford Educational exam packs offer a hassle-free and superb value solution for exam season. The FX85GTX Exam Pack contains a full geometry set in a tin, a Casio FX85GTX Solar scientific calculator and a fully transparent plastic pencil case, packed in a transparent A4 Project Case!. Order any quantity for immediate despatch! Order 30 or more FX85GTX Exam Packs and recieve an automatic 54p discount off of each pack - only £11.20 each! Oxford Educational exam packs offer a hassle-free and superb value solution for exam season. The EL-W531 exam pack contains a full geometry set in a tin, a Sharp EL-W531 scientific calculator and a fully transparent plastic pencil case, packed in a transparent A4 Project Case!. Order any quantity for immediate despatch! Order 30 or more EL-W531 Exam Packs and recieve an automatic 34p discount off of each pack - only £7.65 each! Oxford Educational exam packs offer a hassle-free and superb value solution for exam season. The EL531TH Exam Pack contains a full geometry set in a tin, a Sharp EL531TH scientific calculator and a fully transparent plastic pencil case, packed in a transparent A4 Project Case!. Order any quantity for immediate despatch! Oxford Educational exam packs offer a hassle-free and superb value solution for exam season. The Aurora AX-595 Exam Pack contains a full geometry set in a tin, a Aurora AX-595 scientific calculator and a fully transparent plastic pencil case, packed in a transparent A4 Project Case!. Order any quantity for immediate despatch! Order 30 or more AX595 Exam Packs and recieve an automatic 20p discount off of each pack - only £5.99 each! Oxford Educational exam packs offer a hassle-free and superb value solution for exam season. The OES-513 Exam Pack contains a full geometry set in a tin, a Oxford Educational OES-513 calculator and a fully transparent plastic pencil case, packed in a transparent A4 Project Case!. Order any quantity for immediate despatch! Oxford Educational exam packs offer a hassle-free and superb value solution for exam season. 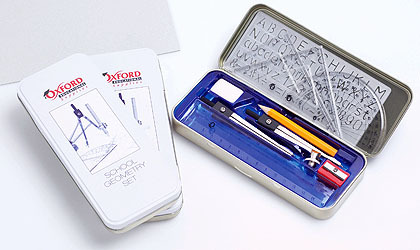 The OES-613 Exam Pack contains a full geometry set in a tin, a Oxford Educational OES-613 calculator and a fully transparent plastic pencil case, packed in a transparent A4 Project Case!. Order any quantity for immediate despatch! Order 30 or more OES-613 Exam Packs and recieve an automatic 55p discount off of each pack - only £5.12 each! All supplied in a robust tin.